Emergency responders had to use a power saw to free a teenager who thought it would be fun to stick her head into a truck’s exhaust pipe at a Minnesota country music festival. Kaitlyn Strom, 19, was goofing around with friends when she spotted the oversize tailpipe. “I was like, ‘Hey, my head could probably fit in that,’” Strom said. “It did fit, but it didn’t want to come back out.” She was stuck in the pickup’s exhaust pipe for 45 minutes before being rescued by a fire crew. 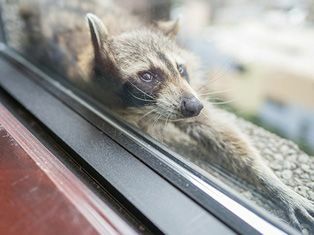 An intrepid raccoon became a social media sensation after it scaled the sheer concrete façade of a 25-story office tower in downtown St. Paul, Minn. The animal was first spotted by an employee of Minnesota Public Radio (MPR) on the 13th story of the UBS Tower, who tweeted a photo of the creature outside his office window. Over the next two days, more workers posted pictures of the raccoon’s death-defying ascent, and crowds cheered the critter from the street. After making it to the roof, the animal was caught in a humane trap and released in the woods. “Can we please have a victory parade for #MPRaccoon?” one fan tweeted.